Serving as an introduction to university life, first week at UBC is an important part of every student experience. With this year's orientation festivities coming to an end last Friday, now seems like a good time to see how first week used to look for students. After a review of the library archives and some help from AMS archivist Sheldon Goldfarb, current AMS President Ava Nasiri and Teri Grant, the first-year experience coordinator, this is what was found. During these early decades, practices such as freshman initiation took place — referred to as hazing by those who disapproved of them — which usually involved incoming students taking part in bizarre activities. “Presumably, this was just a joke, but in later years there was increasing controversy over initiation ceremonies,” read Goldfarb's documents. Controversial hazing exercises were commonplace during these early decades. In the year of 1919-1920, The Ubyssey titled it a “barbaric ordeal,” according to Goldfarb's papers. But when a special general meeting of students was called to discuss these practices, students voted against milder forms of initiation. In 1924, The Ubyssey declared the end of physically dangerous initiation rites. However, Goldfarb's documents suggest that this was not true. In 1927, plans for a less dangerous initiation went wrong when a planned sports event led to a fight between mobs of over 400 students. Two students ended up in the hospital. Things seemed to have calmed down in the decades that followed the 1930s, however. 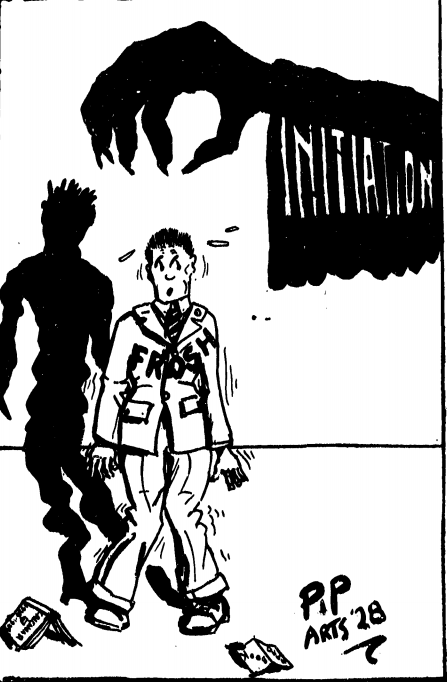 In the 1943-44 academic year, for instance, hazing had suddenly reached a new low with freshmen initiation remaining quiet, according to the UBC archives. Some hazing practices continued, notable examples being “ink bottle” fights between boys in the early 1940s — that resulted in what the Province called “black eyes, torn shirts and watery destruction” — and some freshmen having to wear “green dunce caps.” There was an apparent resurgence of hazing in the years between 1955-1957, primarily due to the engineers. This time, however, the frosh retaliated and marched the engineering building — flooding the place with fire hoses. By the onset of the 1960s, hazing had died down in its intensity — replacing this trend was frosh week, which started in the 1960-61 academic year. However, archival sources confirm that the newly introduced frosh activities also led to a “riot” between various groups of first-year engineers the following year (the incident involved a car being pushed through glass doors in one of the engineering buildings). From that point on, through the 1970s and up until about 1990, organizational changes began to take place under tamer social conditions. The AMS began to establish student-led programs such as the First Year Students Committee, established in 1982, which aimed to ease the transition for incoming freshmen. This committee was abolished in 1993 in favour of summertime introductory programs such as tours, information providers and committees aimed at freshmen to essentially help fulfill the same purpose — assisting them in their integration into university life. Then, in 1997-98 Academic year, what is arguably the most advertised orientations event today began — Imagine Day. 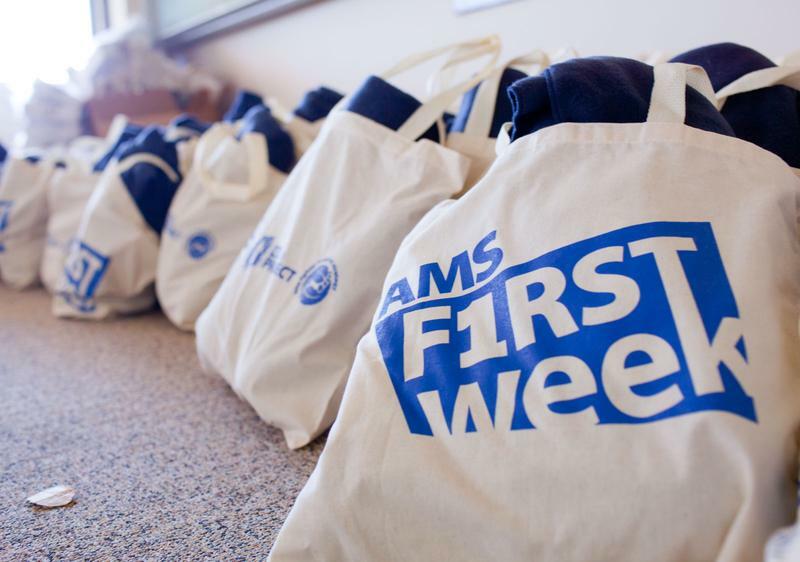 In 2000, the AMS introduced Firstweek, which has remained an AMS staple to this day. And now, having moved past the 2000s and into the 2010s, one could ask the question — what can we expect of first week events in the future?